My preferred approach to analyzing anime is to examine the narratives in terms of interlocking genres. Generally speaking, commercially successful art conforms to established structures and favors certain types and tropes. Storytelling no more needs reinventing than the wheel. Structure presents no barriers to creativity. Rather, a foundation of the "same old" presents new opportunities to surpass the expectations of the audience in unexpected ways. 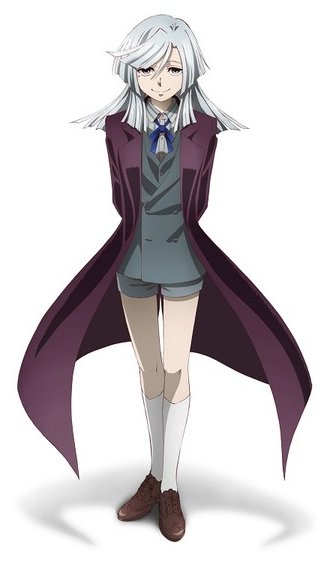 A prime example is Madoka Magica, which discovered eschatological horror within the magical girl genre. And invented a whole new way of telling an old story that soon took on a life of its own. 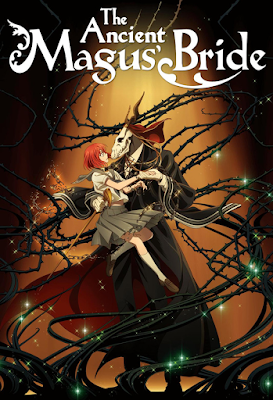 Take an archetypal tale like Beauty and the Beast, mix in western magic, eastern theology, Jungian psychology, and a bit of The X-Files (especially in the balance between the light and heavy dramatic elements), set it in England, and the result is The Ancient Magus Bride. In his ongoing manga series and twenty-seven episode anime, Kore Yamazaki's unique approach is to mix and match the beastly elements. Aside from his height (six-foot seven or so) and the horned wolf skull that hides his demonic visage, Elias Ainsworth is every inch a proper English gentleman. Although from all appearances an ordinary Japanese teenager, Chise Hatori is a psychological basketcase. Her mind is as much a beast as is Elias's appearance. Driven half-mad by her mother's suicide and the second sight that allows her to see the yokai and ayakashi (monsters and magical beings) that populate the mortal realm, Chise resolves to kill herself as well. At the last minute, she is persuaded to sell herself to a trafficker in the black arts. Elias Ainsworth brings the auction to a halt with an outrageous offer of five million pounds. 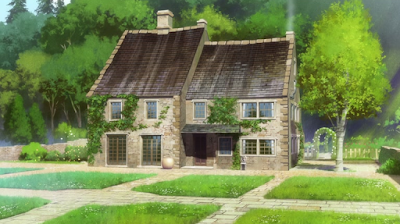 He takes Chise to his cottage in the English countryside, where he bluntly admits to acting with ulterior motives. He has identified Chise as a rare "Sleigh Beggy." This Manx term refers to a kind of fairy that once inhabited the Isle of Man. Chise turns out to possess extraordinarily magical powers. But she has little idea how to use them and every attempt inexorably saps her strength. If nothing is done, she will die in a few short years. Chise becomes Elias's apprentice and a member of his eccentric family. When not traveling about the British Isles solving paranormal problems like Mulder and Scully, Elias dotes on her and vows to save her life. His "purchase" of Chise included a marriage contract. Elias treats the marriage as a done deal but doesn't act on it. He is, in fact, bewildered by his growing fondness for her. Like Data in Star Trek, his affection for Chise only heightens the differences between him and the humans among whom he dwells. And when she leaves, he sits in the living room and sulks. At times like this, Elias is basically every overly-introspective introvert ever. But, of course, the Beauty returns to the Beast, in a stunning and exhilarating scene that casts even the Disney version into shadow. Except there will be no neat resolution to their strange relationship. Elias has a beastly side considerably more untamed and dangerous than the fairy tale. And yet Chise will later formally propose to him, a scene made all the more poignant precisely because Elias is not a frog about to turn back into a handsome prince. The second cour picks up when the first left off (the OVA exploring Chise's backstory takes place between the two cours) with little morality plays featuring characters that will play important parts later. And then The Ancient Magus Bride dives into the horror genre in a highly effective concluding arc. The story of an immortal longing for death is a darker version of the 2017-2018 season of Lucifer. The immortal in Lucifer is Cain (of Cain and Able). 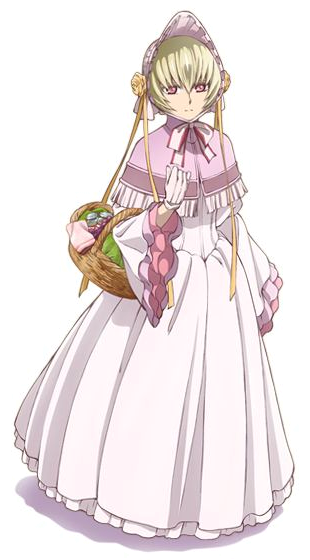 In The Ancient Magus Bride, the immortal is Cartaphilus, the "Wandering Jew" of medieval folklore. An Armenian archbishop, then visiting England, was asked by the monks of Saint Albans Abbey about the celebrated Joseph of Arimathea, who had spoken to Jesus, and was reported to be still alive. The archbishop answered that he had himself seen such a man in Armenia, and that his name was Cartaphilus, a Jewish shoemaker, who, when Jesus stopped for a second to rest while carrying his cross, hit him and told him, "Go on quicker, Jesus! Go on quicker! Why dost Thou loiter?" to which Jesus is said to have replied, "I shall stand and rest, but thou shalt go on till the last day." The conflict here focuses on means and ends. Cartaphilus is fascinated by Chise, a magical being doomed to die while he is doomed to live. A supernatural Dr. Frankenstein, he schemes to graft her body into his and absorb its nature. He does not care how many innocents are sacrificed along the way. Elias, likewise, will do anything to protect Chise, except Chise cannot allow him to do anything, to become a mirror image of Cartaphilus. 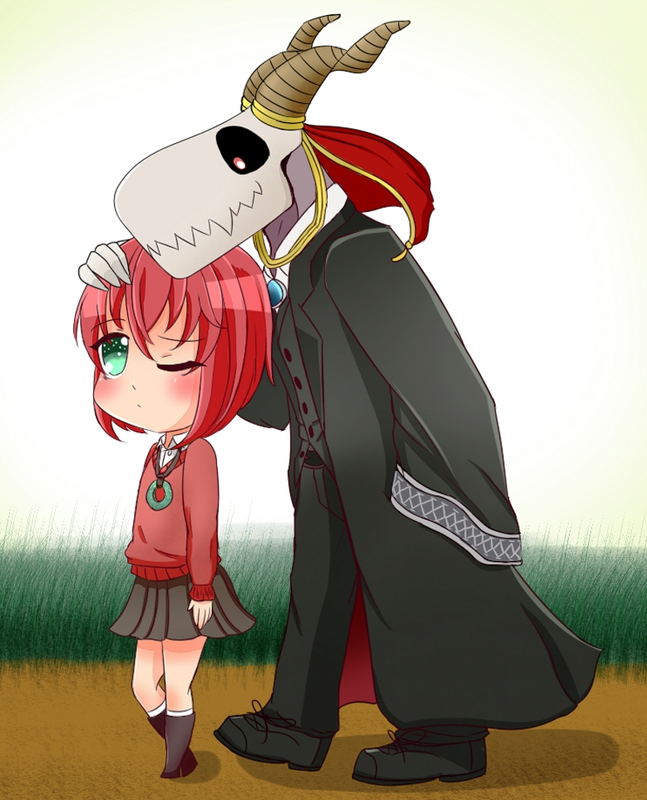 Ruth (Chise's canine familiar) wryly observes that the relationship has shifted from Elias teaching Chise how to be a mage to Chise teaching Elias how to be an human being. This is very intense stuff. Thankfully, the high drama is leavened by the use of comical double-takes in the chibi (super-deformed) style. Another constant delight is voice actor Ryota Takeuchi, who plays the part of Elias like a double bass. Visually, The Ancient Magus Bride is a treat from beginning to end. It can seem at times that the entire budget for the anime went into creating the breathtaking background art, that often brings to mind verdant Turner landscapes. This is Merlin's Albion, the England of Tolkien and C.S. Lewis fused with the Shinto cosmology of Princess Mononoke and Spirited Away. As depicted in anime such as Mary and the Witch's Flower, Witch Hunter Robin, Black Butler, and even Hellsing, Japanese fantasy writers are fascinated with the world that lies beyond the English wardrobe, and delight in fusing together two cultures a literal world apart. For example, although she began her enchanted life as a banshee, Silky has become a species of brownie known as a silkie, a female spirit "associated with the house rather than the family who lives there. But like a brownie, she is said to perform chores for the family." The silkie closely resembles the Japanese zashiki warashi, a house spirit that blesses the homes of those who treat it well. Silky is no singing candelabra but she does create a warm and inviting place where this strange menagerie endeavors to become better at being whatever species of the supernatural they happen to be.